Membraneless assemblies of positively- and negatively-charged molecules can bring together RNA molecules in dense liquid droplets, allowing the RNAs to participate in fundamental chemical reactions. These assemblies, called "complex coacervates," also enhance the ability of some RNA molecules themselves to act as enzymes—molecules that drive chemical reactions. They do this by concentrating the RNA enzymes, their substrates, and other molecules required for the reaction. 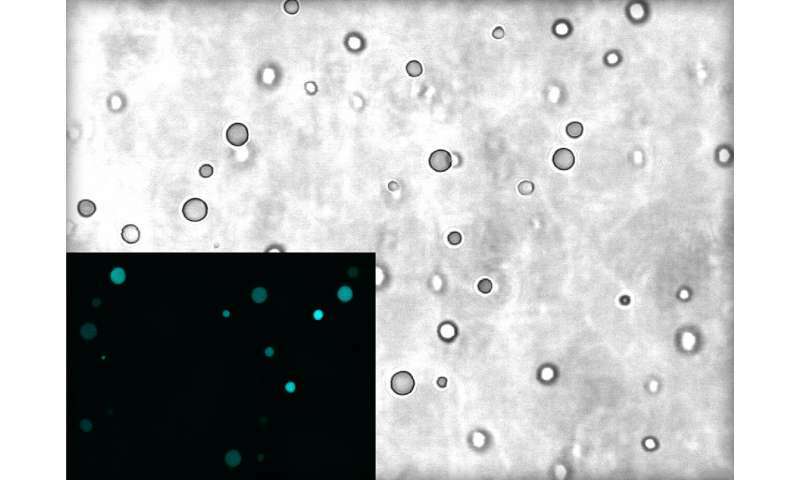 The results of testing and observation of these coacervates provide clues to reconstructing some of the early steps required for the origin of life on Earth in what is referred to as the prebiotic "RNA world." A paper describing the research, by scientists at Penn State, appears January 30, 2019 in the journal Nature Communications. Life as we know it today generally requires genetic material—DNA, which is first transcribed into RNA. These two molecules carry information for the production of proteins, which are in turn required for most functional aspects of life, including the production of new genetic material. This sets up a "chicken and the egg" dilemma for the origins of life on early Earth. DNA is required to produce proteins, but proteins are required to produce DNA. "RNA—or something similar—has been thought of as a key to solving this dilemma," said Raghav R. Poudyal, Simons Origins of Life Postdoctoral Fellow at Penn State and first author of the paper. "RNA molecules carry genetic information, but they can also function as enzymes to catalyze the chemical reactions needed for early life. This fact has led to the notion that life on Earth went through a stage where RNA played an active role in facilitating chemical reactions—"the RNA World"—where self-replicating RNA molecules both carried the genetic information and performed functions that are now generally carried out by proteins." "You can think of these RNA enzymes like a car being produced in an assembly line," said Poudyal. "If you don't have the parts in the right place in the factory, the assembly line doesn't work. Without coacervates, the parts needed for chemical reactions are too dilute and are unlikely to find each other, but inside the coacervates, all the parts that the enzyme needs to work are nearby." "Although all the polyamines we tested were able to participate in formation of RNA-rich droplets, they differed in their ability to support RNA elongation," said Christine Keating, professor of chemistry at Penn State and a senior author on the paper. "These observations help us understand how the chemical environment within different membraneless compartments can impact RNA reactions." "Although we can't look back to see the exact steps taken to form the first life on Earth, coacervates like the ones we can create in the laboratory may have helped by facilitating chemical reactions that otherwise would not have been possible," said Poudyal.